The Amtrak Vermonter arrives at the downtown passenger train platform in Holyoke, Ma. It will be one of the stops for new commuter rail trains operating on the Knowledge Corridor Line between Springfield and Greenfield starting in 2019. Massachusetts Governor Charlie Baker announced new passenger rail service is coming to western Massachusetts next year. 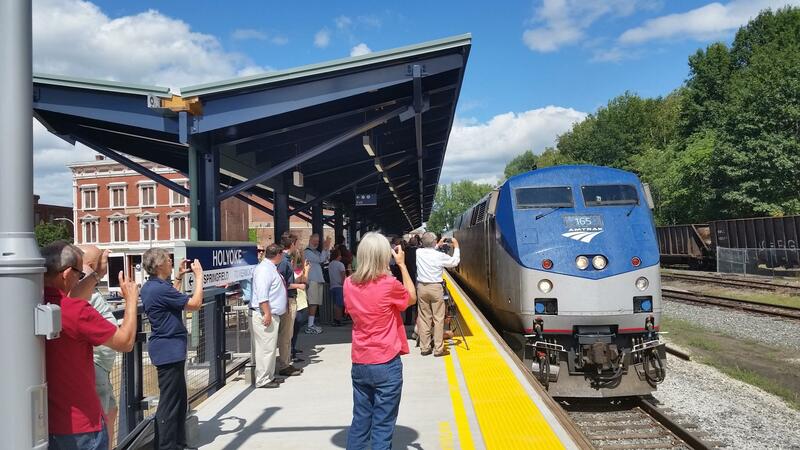 Speaking in Springfield’s Union Station Tuesday, the Republican governor said a deal has been finalized to have Amtrak operate commuter trains between Springfield and Greenfield on a pilot basis starting in 2019. "That is going to leverage the MassDOT-owned Knowledge Corridor, which is currently used by Amtrak's Vermonter service and the recent renovations that have been made here at Union Station," Baker said. The announcement by Baker comes just days before the launch of new train service on the Hartford Line between Springfield and New Haven. "It will give us the chance to take a comprehensive look at all the options possible and to make the best decision going forward for the Commonwealth and for the region," said Baker.